Trains Today: Ooops- I ended up in China again! Ooops- I ended up in China again! 'I have no intentions to return to Chinese steam any time soon but it is certainly not beyond my imagination that I may end up out here again' - These were the words at the end of my report on the Sandaoling Mining Railway back in early 2014. Very close to the end of 2016 I still had no real intention to travel back to China, but somehow I found myself booking flights in January 2017 and in February after a quick visit to the visa office in London I was back in China. Only two steam locations were visited this time, the decline naturally having continued since my last visit. Full reports on the almost Siberian WiJiu and the worlds last steam mecca at Sandaoling will follow. 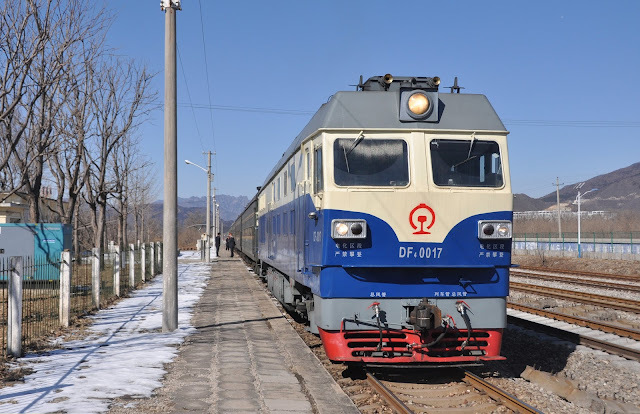 In the mean time I leave you with a very typical Chinese train of old, Working train 4471 the 11:10 from Changping Bei to Chengde around 15 minutes into it's journey behind DF4 0017 (This is a DF4C and not the original DF4 0017!) at Guan Gau. I've always liked the DF4's and it was nice to be able to find an excuse for a ride behind one during our time in China. These locos are still very common though with the seemingly unstoppable electrification of non-High Speed routes many duties are being replaced by electric traction.